With its advanced selective entry technology, our PetSafe® Microchip Cat Flap has been designed to allow your cat easy access to the outside world whilst keeping other troublesome cats and animals out of your house. Using radio frequency identification (RFID) technology, it works by reading your cat’s unique microchip ID without the need for a collar or accessory. When your cat approaches the cat flap, the flap will respond by allowing only your cat to enter. The cat flap will remain locked and deny access to cats that are not programmed, wild animals, pests and strays. The cat flap is also designed with a convenient Manual 4-Way lock that allows you to control the access of your programmed cats. 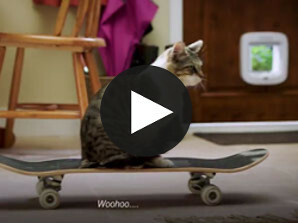 The 4-Way Manual lock allows you to control your cat’s access in and out of your home in either direction. Until your pet is thoroughly familiar with using the cat flap, it is a good idea to only use the 4-Way Manual lock in the In or Out position only. Each of my cats has understood its operation and it is with great pleasure that they walk freely without us having to intervene. This easy-to-install cat flap is very practical and meets all our expectations, I will advise it to my cats owner. The flap was well made and well packed. During the installation I appreciated the detailed guide, the template and the tips. Perfect for my expectations: I wanted my cat to be able to go out independently without other cats entering the house + no more litter in the house. Very good experience. 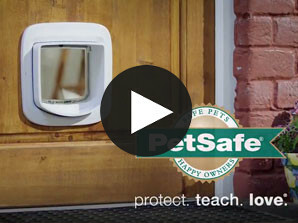 Visit the PetSafe® online shop and find microchip accessories such as installation kits, tunnel extensions and collar keys.